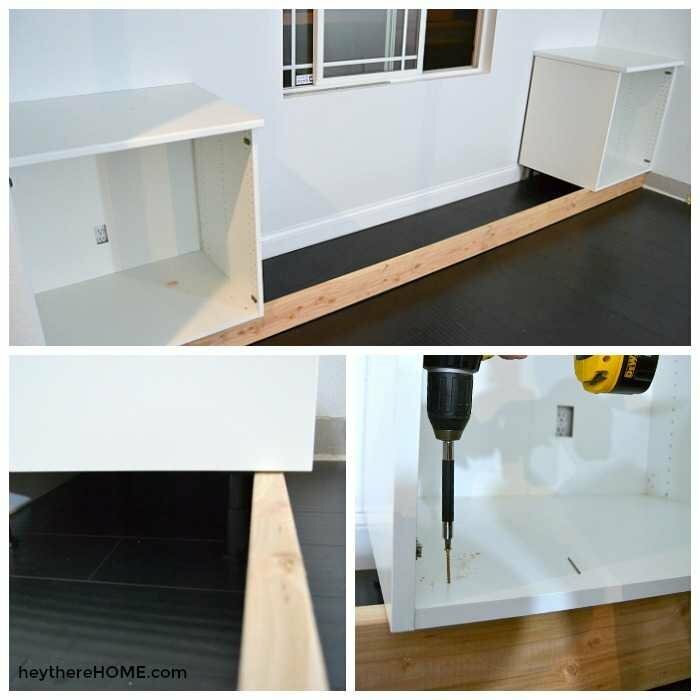 Inside: How to build built-ins with a bench seat plus printable instructions! 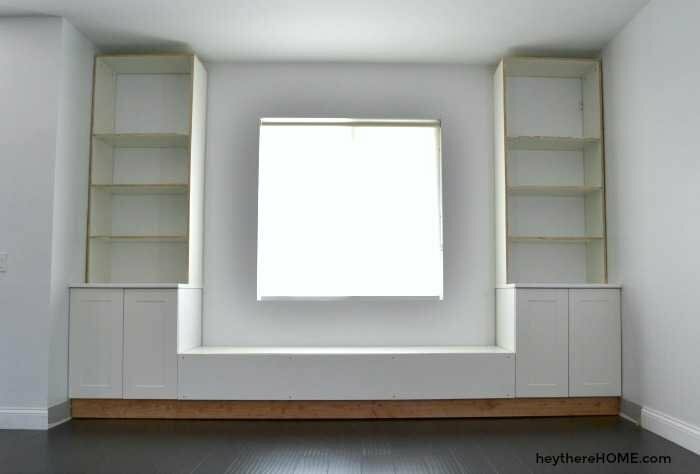 Seriously you guys I can’t even believe how good these DIY built-ins with a bench seat turned out! Just ask my neighbor, she probably sees me standing and staring at them daily through our front window. So I took my nerves to mean that I cared a whole heck of a lot about making these built-ins look like I’d hired a professional. So I dove in… and the result?!?! 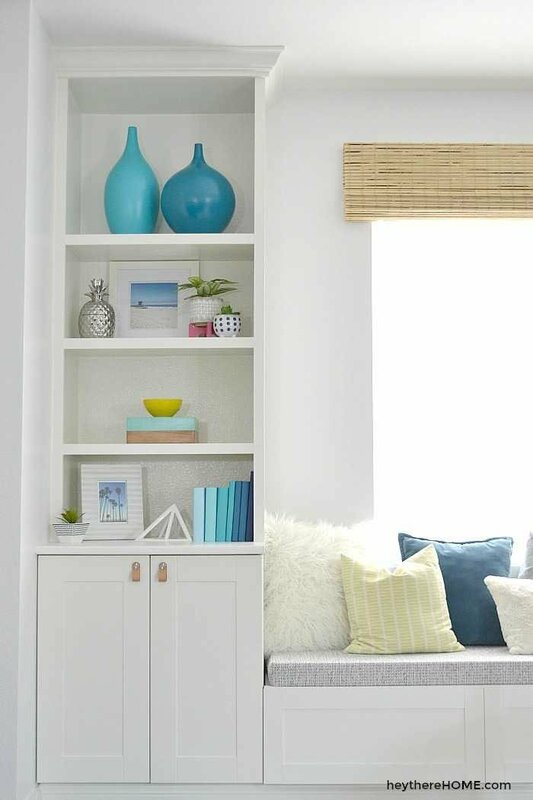 DIY built-ins with a bench seat that add a TON of character to my suburban cookie cutter tract home! 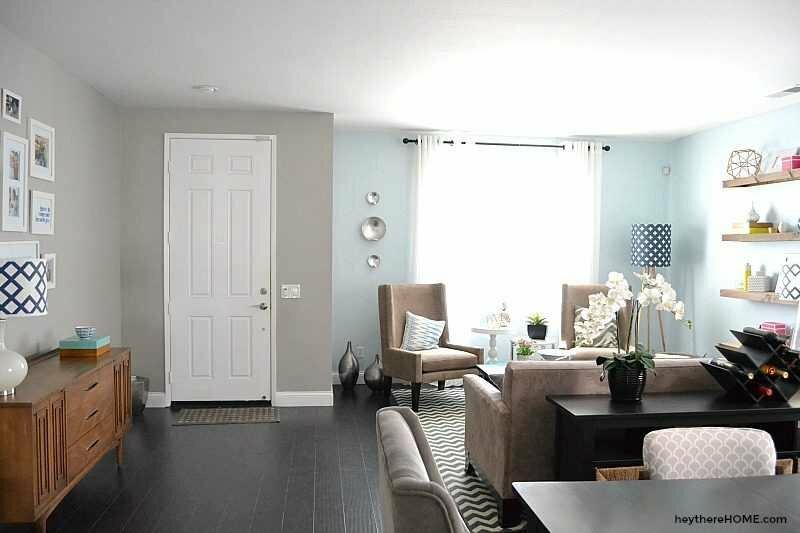 Before we get into the process in this uber long post I’m about to dish out, let’s take a look at how this room has evolved in the almost 8 years we’ve lived here. 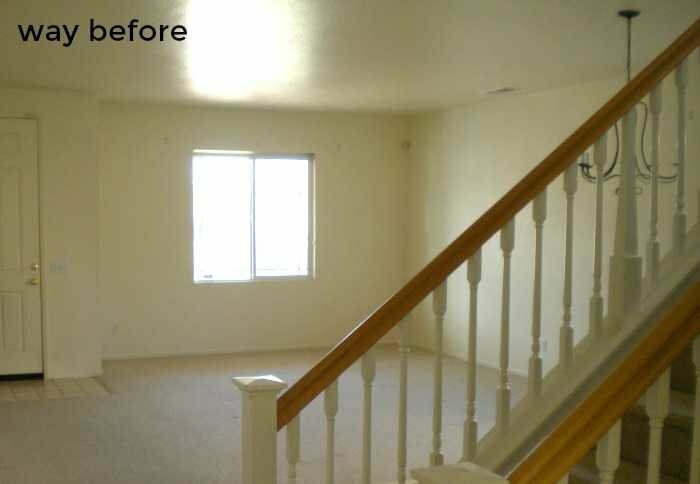 2010 | So we replaced the flooring, installed 5 inch baseboards with a bright white paint, painted the walls a nice shade of greige, and added the furniture that had followed us from our pre-married days. 2014 | So in an effort to add some color — and life to this room I painted the walls a light blue and created a faux hexagon wallpaper look with a sharpie. 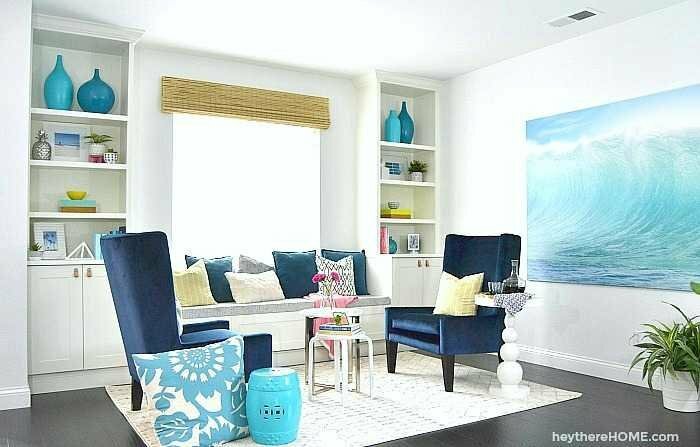 I also added those DIY wooden shelves in an effort to add some character and define the space and used more colorful accent colors. I definitely liked it more, but it still felt like a bunch of furniture in a room without much personality — point is, it didn’t feel like somewhere I’d want to hang out. 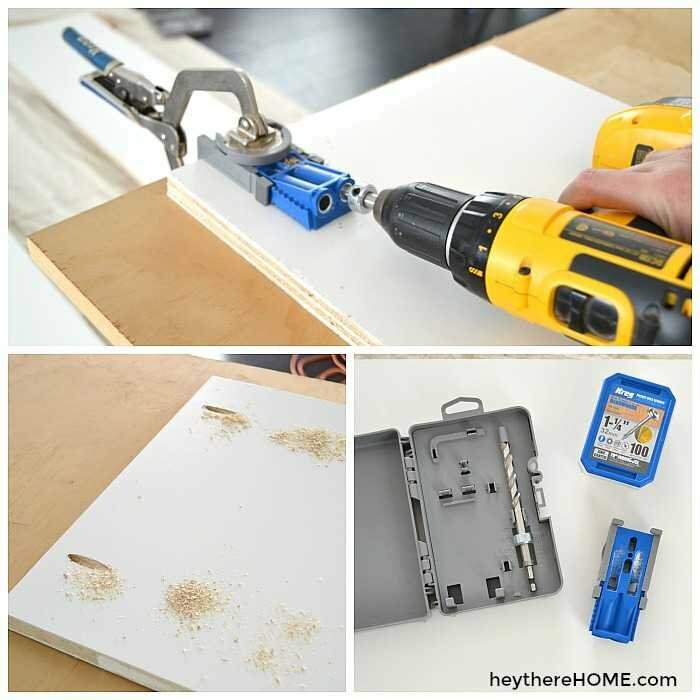 I wouldn’t call this project a total beginner project, but if you can use some simple power tools you can totally do this. –For what it’s worth I did almost all of this project by myself. 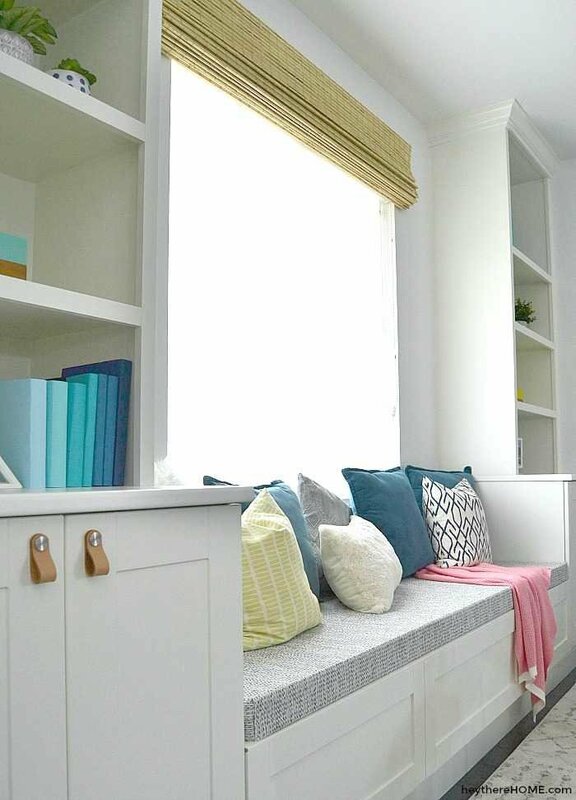 This post is an overview of how we built our built-ins with a bench seat. 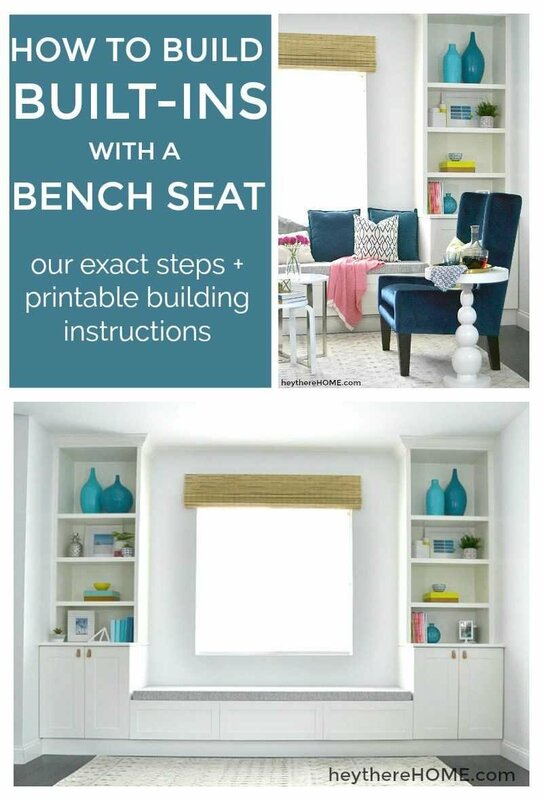 For step-by-step instructions based on the measurements of your home, you can get instant access to printable instructions + measurements worksheet here. 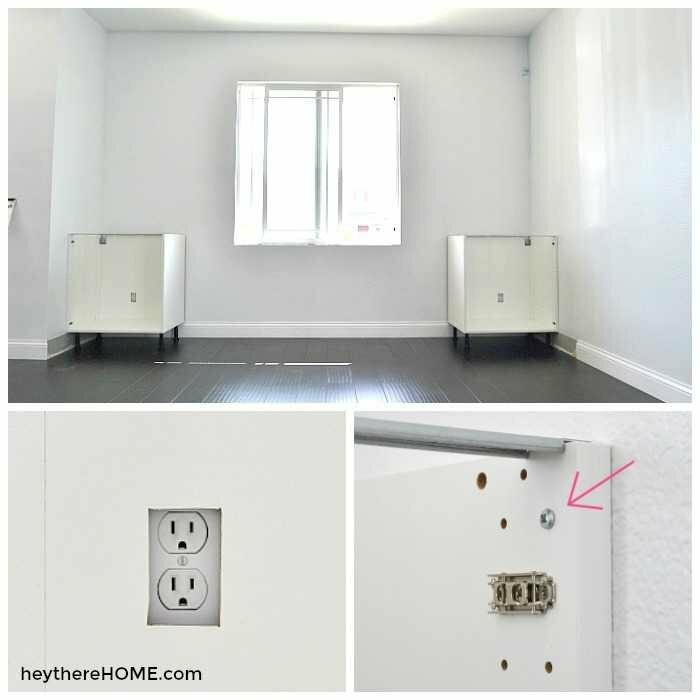 (optional) furniture hole covers – if you have outlets that you’ll be building in front of and want to be able to access them on your bottom shelf. 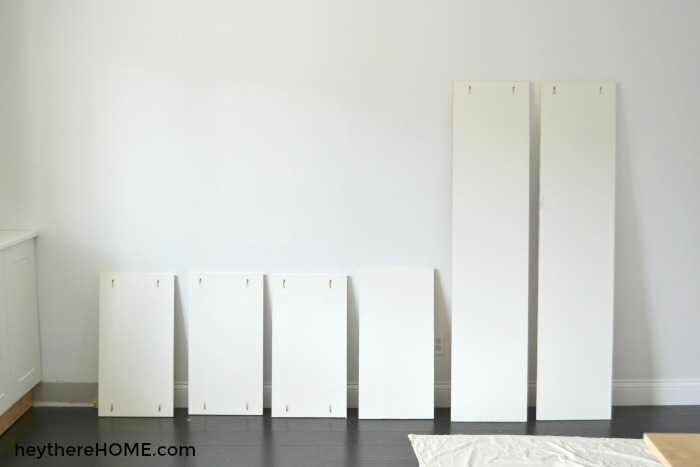 Step 1 | Build the 2 Ikea base cabinets and place them at each end. There are outlets behind each of our cabinets that we wanted access to so I cut a hole in the back of each cabinet to expose the outlet before placing them. Then I placed each cabinet and secured them to the wall with a screws from the inside of the cabinets. I cut both pieces of countertop from one Ikea Lilltrask countertop. The piece comes with 2 finished edges which became inside piece on each cabinet with our cut edge going against each wall. I followed the instructions that came with the countertop to attach the countertop to each base cabinet. I placed a 2 x 6 the length of the built-in. It goes under the cabinets on each wall and is secured using wood screws through the bottom of each cabinet from the inside. Place four 2 x 6s from the already placed 2 x 6 to the wall equal distances apart. Next I built 4 rectangle frames using 2 x 4s and attached them to each 2 x 6 piece using wood screws and a drill bit holder to extend the reach of our drill. You’ll notice that the rectangles come out to the same depth as the cabinet. This is what it looks like when the cabinets are placed and the bench seat is framed. Holding the front panel of the bench seat in place, we lined up the bottom edge with the bottom edge of the rectangle supports and attached the front panel using wood screws at the top and bottom of each support. Next we place the top of the bench in place and secured it with wood screws at the support points. To hide the seam where the two pieces come together at the front of the bench I attached a flat trim piece along the edge using a nailer. 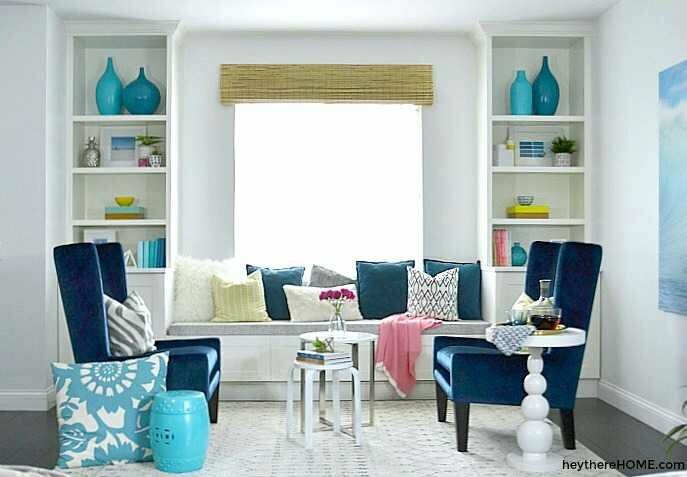 *This flat trim piece also acts as a small lip to hold the bench cushion in place. Then I drilled 2 pocket holes on the inside of each side piece at the top. 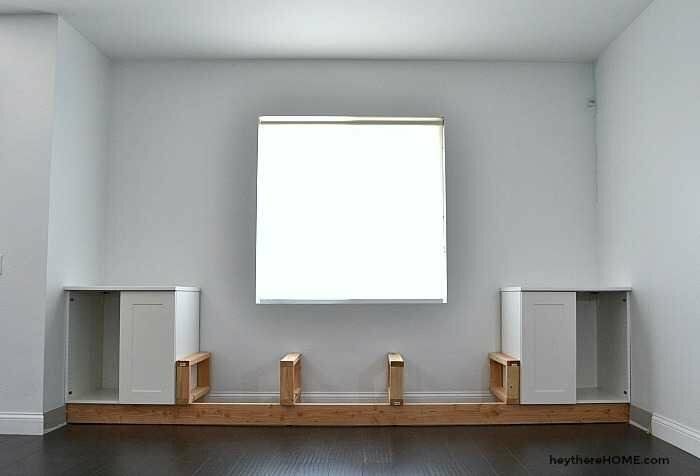 Fore each shelf unit there will be 3 shelves with 4 pocket holes each, one top piece, and 2 side pieces with 2 pocket holes at the top. Next I measured and marked the spacing for each shelf starting at the bottom of the side piece and made the marks on both edges. 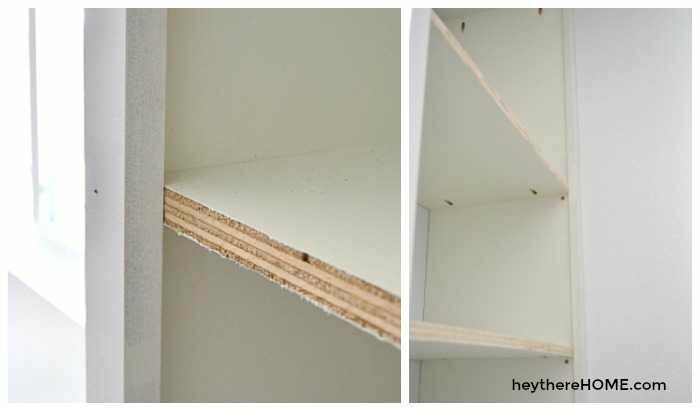 To attach each shelf, I lined the bottom side of each shelf up with the marks (pocket holes facing the bottom of the side piece) and attached with Kreg screws. * Be careful cause at this point the shelves are flimsy. I repeated this for each shelf. For the top shelf piece I placed it next to the top of the side piece (so its edge is on the floor) and attached it with a kreg screw using the pocket holes I made on the side piece. I laid my second side piece flat, pocket hole side up. Then I carefully flipped the partially built bookshelves over and onto the second side piece. I measured and marked the exact same measurements that I did on the first side piece and lined up the bottom edge of each shelf before securing with a kreg screw. 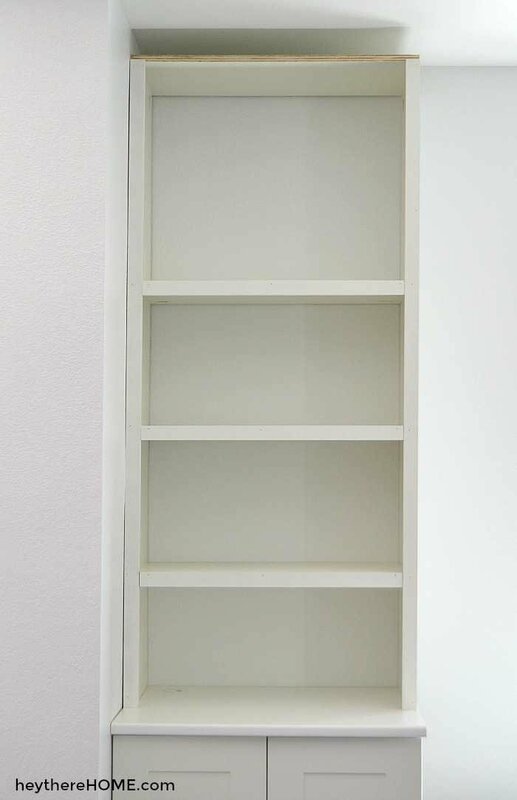 Line up your bookshelf so that it’s square with the base cabinet and as close to the side and back wall as possible. 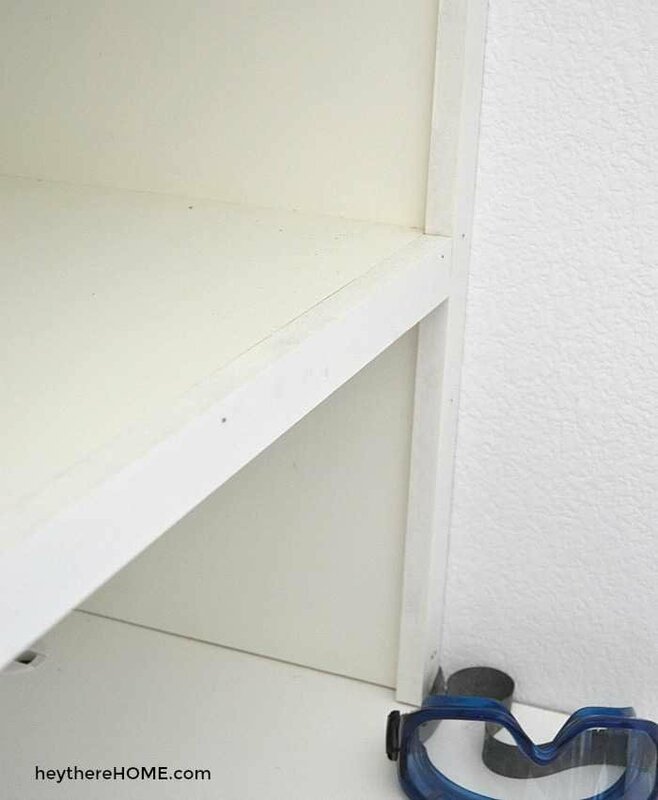 I used shims between the side wall and the bookshelf to keep it in place and secured it to the wall using a wood screw from the inside of the bookshelf, just under each shelf and toward the front edge. I repeated step 8-13 for the other bookshelf. 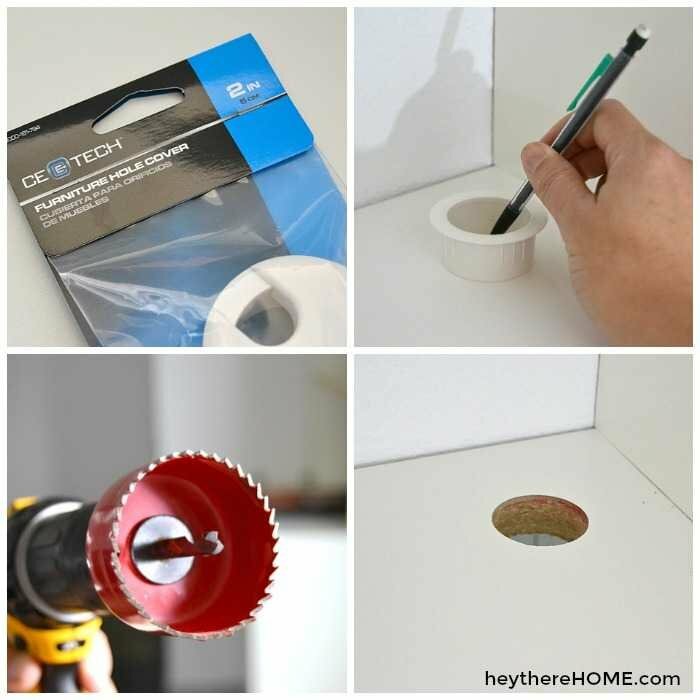 In order to have an electronic on the bottom shelf of our built-in we drilled 2 inch holes using a hole saw in the top of our countertop in the back corner and finished them with a furniture hole cover so that we could feed a wire down to the plug. I used 1 x 2 birch wood to trim my shelves and give them a more finished and substantial look. First I cut a piece of 1 x 2 the height of my shelf unit, not including the top shelf piece and secured it with a nailer lining up the outside edge of the trim with the outside edge of my shelf unit. The piece against the wall will go as close to the wall as possible while remaining straight up and down. There will be overhang on the inside portion of the shelf. Step 15 | Next I measured the distance between each trim piece I just installed along each shelf. I cut at attached a 1 x 2 to each shelf lining up the top edge with the top of each shelf. I measured, cut, and attached one final 1 x 2 across the top shelf. This was the first time I’d ever done any crown molding and to say it can be complicated is an understatement. But after making some mistakes, and doing some research I discovered this crown molding tool that made the entire process really easy. 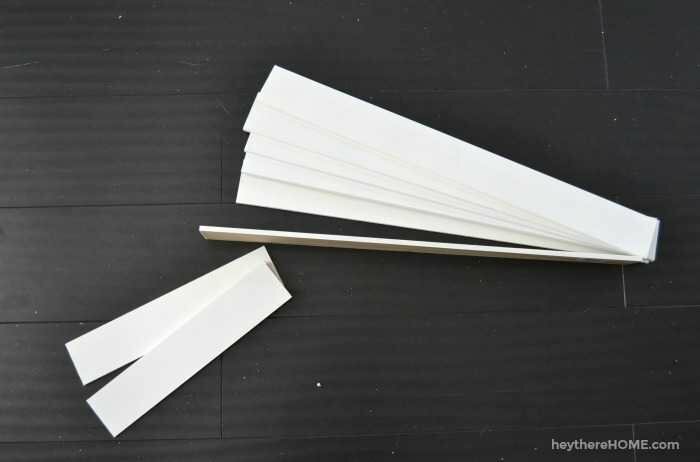 Step 17 | Measure and cut your crown molding. I followed the instructions on my Kreg Crown Pro to get the right measurements and angles and using a 12″ miter saw I cut my crown. 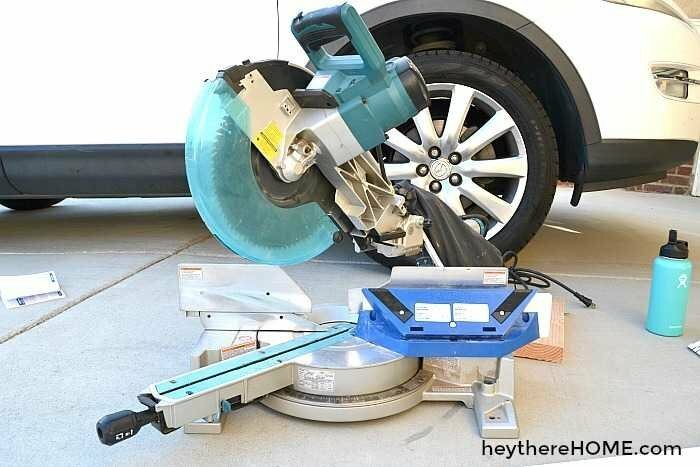 ** I had to rent this saw because mine is 10″ and cutting 5″ crown with the Crown Pro didn’t allow enough clearance to make my cuts. The bigger saw did the trick. Once you have your measurements you lean your crown molding against the crown pro to make your cut. It holds it at the perfect angle for you. I tested my corners to make sure they lined up nicely. 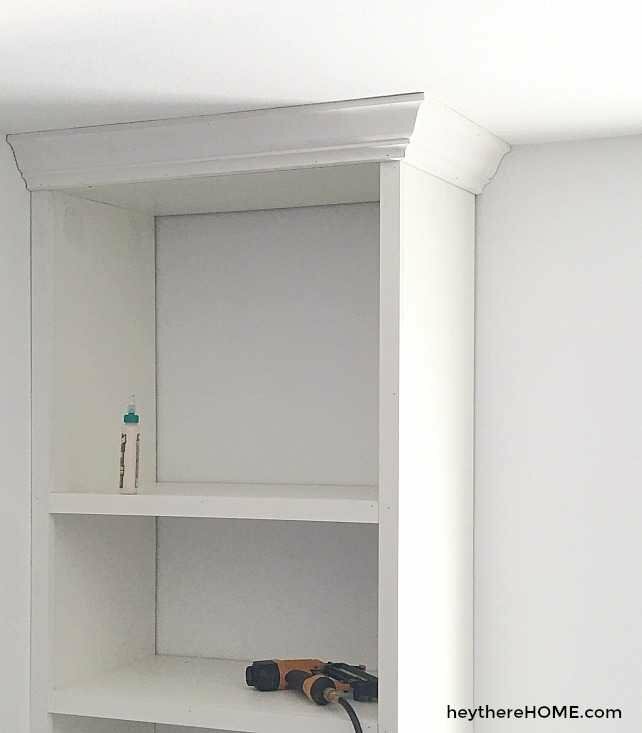 I attached my crown molding into the top trim piece and side of the shelf along the bottom and into the ceiling at the top using a nailer. I added front trim to my bench seat to mimic the look of the cabinets I chose. I used 2 1/2″ x 1/4 poplar board. Because my bench seat is 92″ long I decided to create 3 rectangles. I planned out my measurements on paper before starting. Step 20 | Cut and attach your trim. I started by cutting one vertical piece the height of my front panel and attaching it using a nailer. 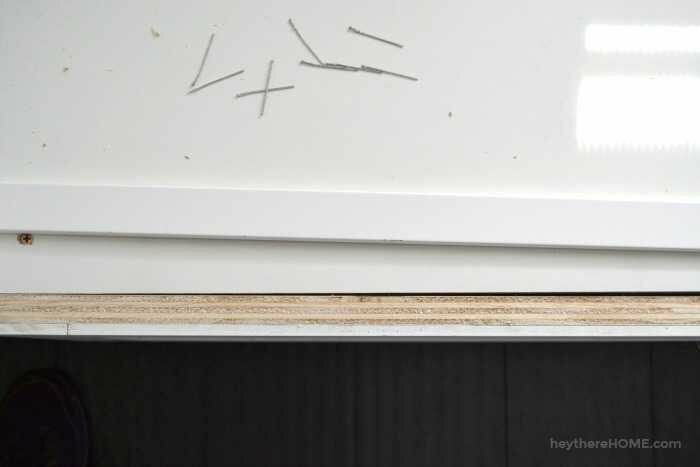 Then using my measurements, I cut two horizontal pieces and attached them leaving a tiny gap between the trim pieces to mimic the detail on my cabinet doors. Finally I added the other vertical trim piece. Next I repeated those steps starting at the other end of my front panel. For the middle rectangle I attached the two vertical (side) pieces, then took measurements for the horizontal pieces before cutting and attaching them. These ones will likely be a tiny bit different from your other horizontal pieces because of the gaps you’ve left. Step 22 | Punch in your nails. Using a nail punch, punch each nail in so that it’s just below the surface of the wood. Fill in all those holes with wood putty and let them dry before sanding. Step 23 | Fill in your pocket holes with plastic wood and let dry before sanding. Step 24 | Sand everything smooth and wipe down with a damp cloth to remove any dust. Step 25 | Caulk all seams. 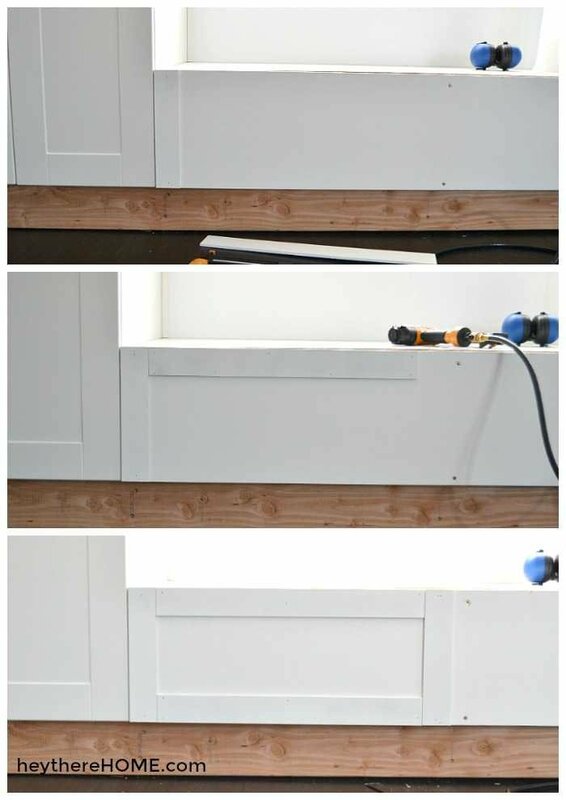 To make the built-in look really built-in you have to caulk all of the seams, even the tiniest ones. This is where it really comes together. 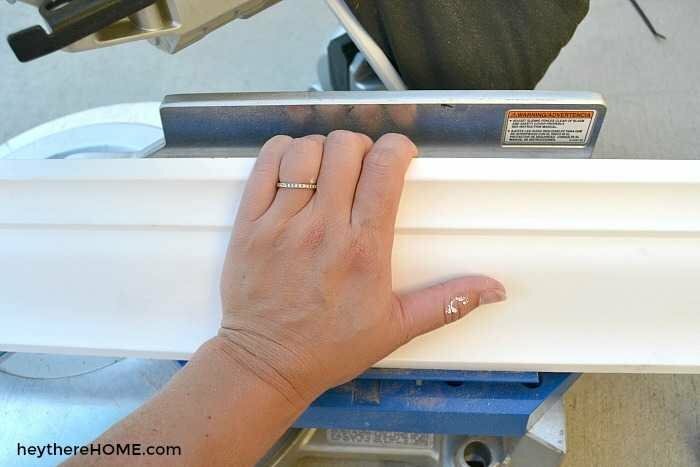 Then immediately twist the end of your caulking gun so the caulk stops leaking out, dip your index finger in a small bowl of water, and run it along the seam pressing just a little to create a really smooth line. Wipe the excess on a damp paper towel and move on to your next seam. 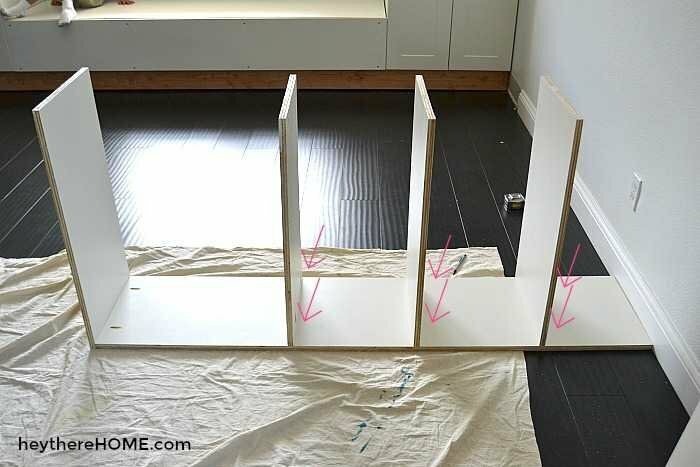 For larger gaps you’ll need to add an extra step. This is because as the caulk dries it shrinks into the gap. 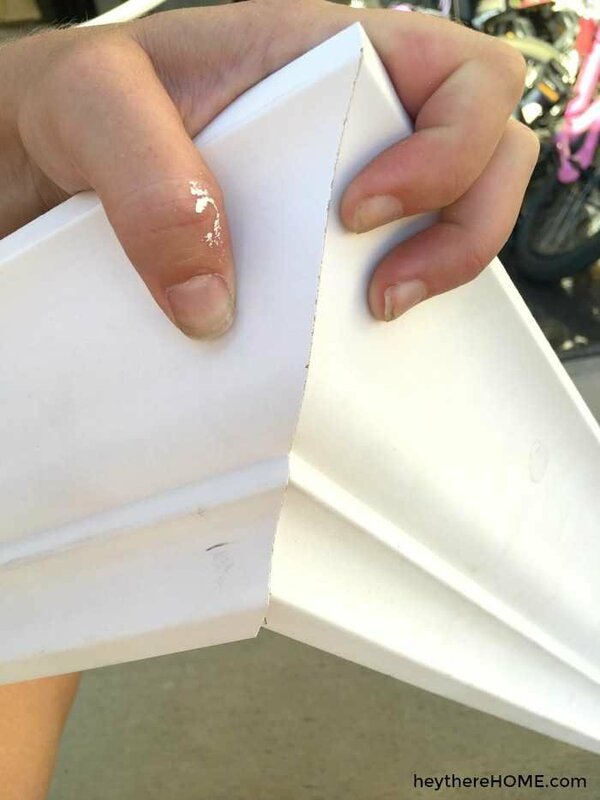 If you try and caulk gaps that are too wide, you will end up with cracks in your caulk and a really messy look in the end. So, grab some computer paper. We’re going to back fill the gaps with it. 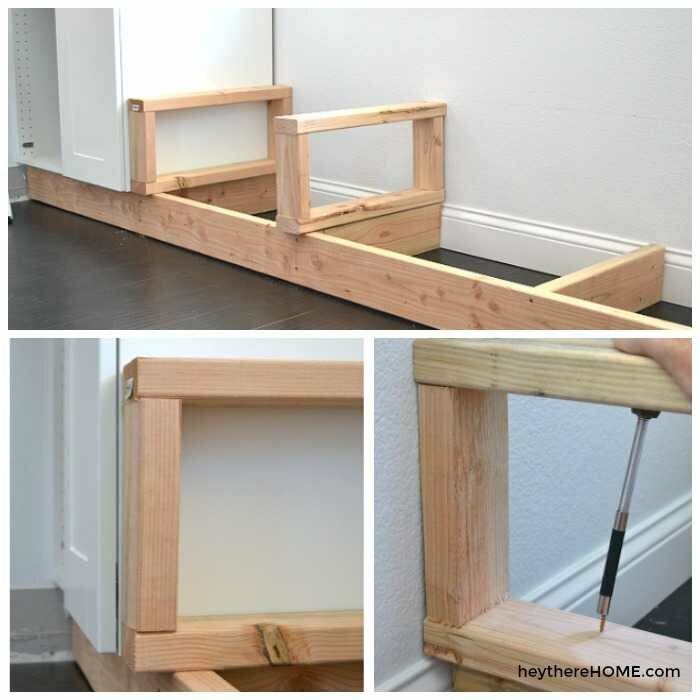 Roll each piece as tight as you can and stuff it into your gap between the wood and the wall. As you let go your roll will expand a little – that’s okay. 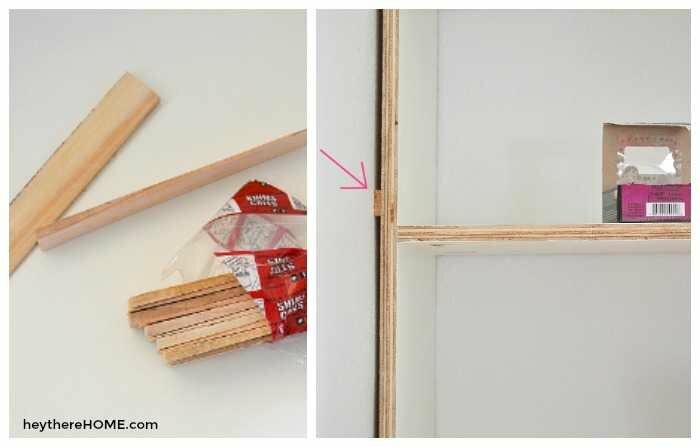 You want your rolled piece of paper to bridge the gap between the wall and the wood but not extend beyond the wood. 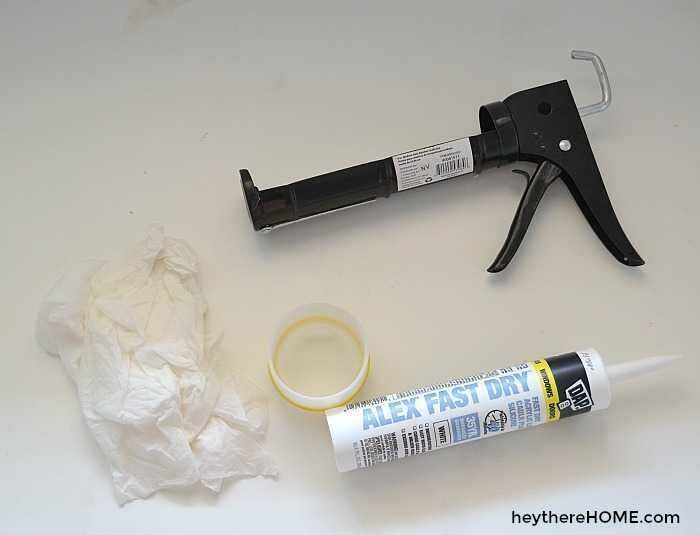 Once you have your rolled paper in place along a seam, apply the caulk much like you did for the smaller gaps. You may need just a slightly thicker line. Run your damp finger along the line. Once everything is dry and clear of dust apply one last coat of paint. I like to use a brush along the seams and corners and a foam roller over that and everywhere else to get a really nice finished look. Pssst: I was so thrilled with how this turned out that I moved onto the kitchen and tackled our old, messy closet pantry. Now I can’t stop looking at our new organized built-in pantry either! 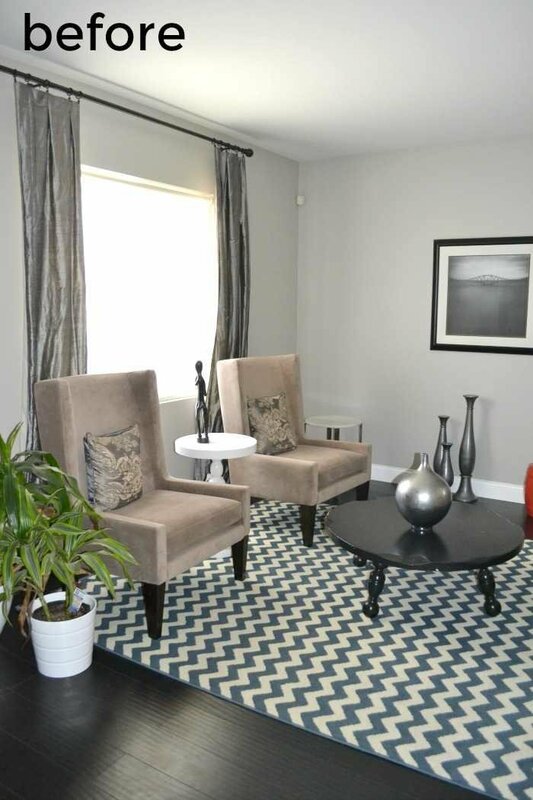 Product Sources: grey and white rug, blue and white pillow, bamboo roman shade. You ready to start this project? Believe me, if I can do this project, you can too. I worked out all the kinks and created a step-by-step printable guide to make it really easy on you. 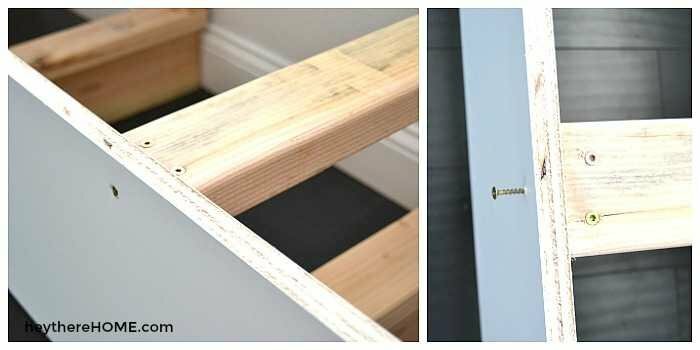 Everything from taking your measurements, creating your plans and cut list based on those measurements, and the step-by-step instructions (with images) + helpful tips that will save you time and frustration are in the Printable Building Plans below. What size cabinets did you use? And what do you think the weight limit is for the bench? Looks amazing! Hey Amber, I used 24 inch cabinets but it will depend on your space measurements (the cabinets come in various sizes). The bench seat is solid. My big guy husband could dance on it and it wouldn’t creak or anything! Thanks for sharing this. 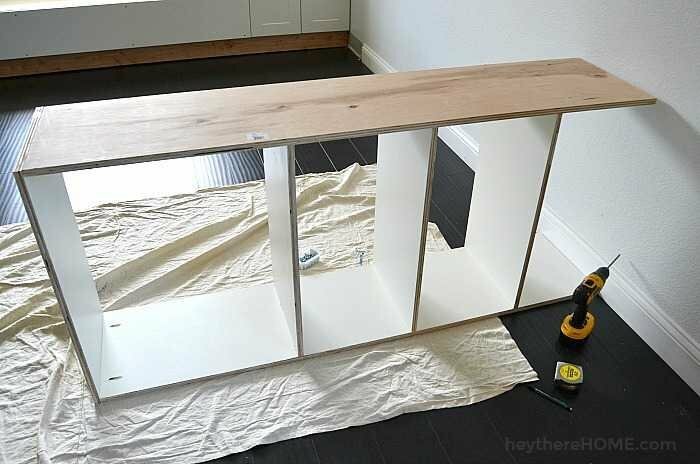 Do you have a tutorial like this for your entertainment center built-in? One more follow up question! What was the quarter round or shoe moulding used for? Thanks for your tutorial. I found it very helpful. 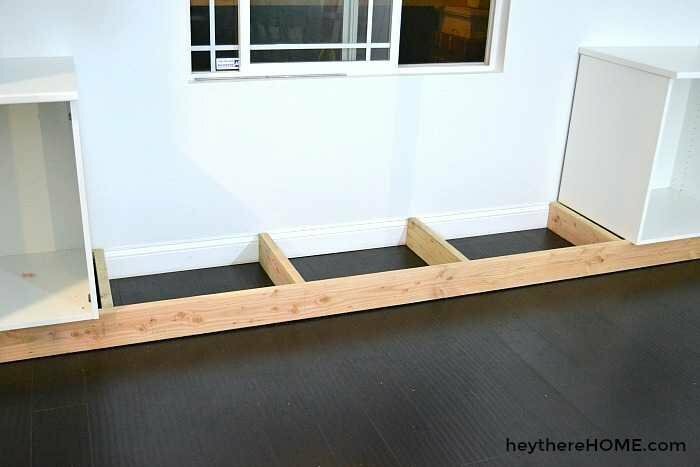 I’m not planning to make a bench seat, but I do want to make a shelf system to go next to my fireplace. You’re so welcome Rita! Thanks for stopping by! Wow, this is a really awesome project! Didn’t expect it to look so good, wanna give it a try here as well! This looks really fantastic, Cory! Love the way it really ties the room together and makes the front window a great focal point. And no wasted space! Yippee! Corey, This is the best “how-to” guide I have ever seen! Makes me think I can actually pull this off, even with my limited imagination. Thanks for sharing your creativeness with the world! I’m delighted you find it helpful, Charlotte! You can do this! Thanks Corey for all of your hard work in putting this together for us! It looks awesome! Will you be offering a tutorial on how you covered your bench cushion? I’d also love to know where you found the fabric you used. I love it! Thanks again! You bet, Lynn. I’m working on the bench cover tutorial and it will be out early spring. Keep your eyes peeled!